As promised, after my pumpkin rant, an elegant autumnal recipe featuring pumpkin. Ever since summer left us, I've been eating like a fatass and thus ripped my favorite pants yesterday trying to shimmy into them. It was like a sad punch line to my diet joke. Pumpkin is evidently very good for you, but it's usually only seen in confectionary treats. I decided to sneak it into a savory dish. Honestly you won't even think you're eating squash. If you're looking to use your cast iron, this is the dish to do so. I find if you add the word "spooky" to anything it makes it Halloween-adjacent, to serve in other seasons simply subtract the word "spooky." This was a total experiment, a Franken-recipe of two of my favorite recipes. It was better than I could have ever anticipated. While not especially challenging, it's epicurean enough to seem impressive to potential lovers and dinner guests. Serve with your favorite scary movie. Step 1: Marinate chicken breasts overnight in wine, thyme, salt and pepper. Step 2: Skin pumpkin with peeler. Remove seeds and cut into sticks. Toss in olive oil, balsamic vinegar, salt and pepper. Roast for twenty minutes at 450. Step 3: Brown chicken breasts in cast iron with olive oil. Set aside and allow pan to cool a bit. 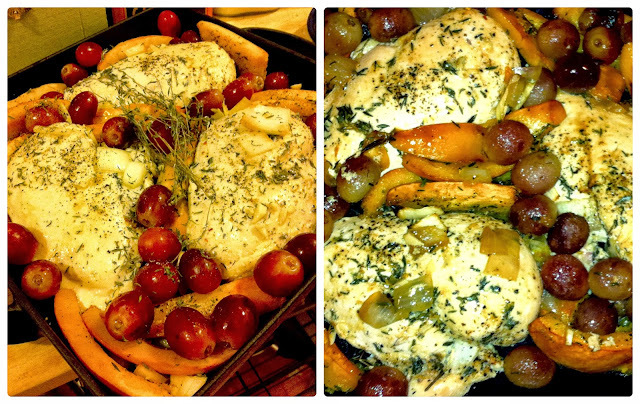 Once slightly cooled, arrange chicken with roasted pumpkin, grapes, onion, garlic and as much thyme as you can fit. Pour wine and olive oil over arrangement and put back in the oven for 30 minutes, or until chicken is 165 degrees. Step 4: Once sufficiently cooked, place chicken and pumpkin on a plate. Add more wine and half a cup of hot water to pan drippings and grapes. Simmer over stovetop for a few minutes until reduced. Serve chicken with steeped grapes, pumpkin and pan juices.